CYNTHIA ALLEN-LAPP became involved with horses as a teenager and now have been in the horse business since 1979. While attending Cal Poly Pomona she competed on the collegiate horse show team and rodeo team. After college Cynthia moved to Yucca Valley and started Yucca Valley Equestrian Center. Over the years Cynthia has ridden cutting, reining horses. She has trained and given lessons in pleasure, trail and pattern classes. 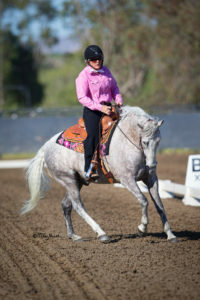 In recent years Cynthia hasbeen riding and training Dressage and Western Dressage horses. She is a USDF “L” graduate and has judged both Dressage schooling shows and Western dressage shows. She competed in two Extreme Mustang Makeovers and placed top 10 in both. In October 2014 she completed the Train the Trainers™ seminar given by Western Dressage Association of America®. Cynthia is also a National Reined Cow Horse judge.